Nada. That was the word on the license plate of our VW Camper. It means nothing. It means Mexico. It means love. But it’s gone. The Camper, the license plate. Now we have a new blue Toyota Corolla with a license plate that doesn’t mean anything. This morning,Mom drove the Toyota Corolla to her job, and Tom drove his old black Saab to his job. My brother is at basketball camp. Little League ended a few weeks ago, my last season. The tennis ball I’m holding doesn’t have any stories in it. Some days it helps me make whole other worlds. I throw it at the duct-tape strike zone on the garage. It hits a rut on the way back to me and caroms into the front yard, rolling to a stop in the grass. I could go get it, try again. Instead I start walking down Route 14 toward Race’s. I buy a couple of packs and walk home. I open the packs in my room. Nada. No Red Sox, no Superheroes. 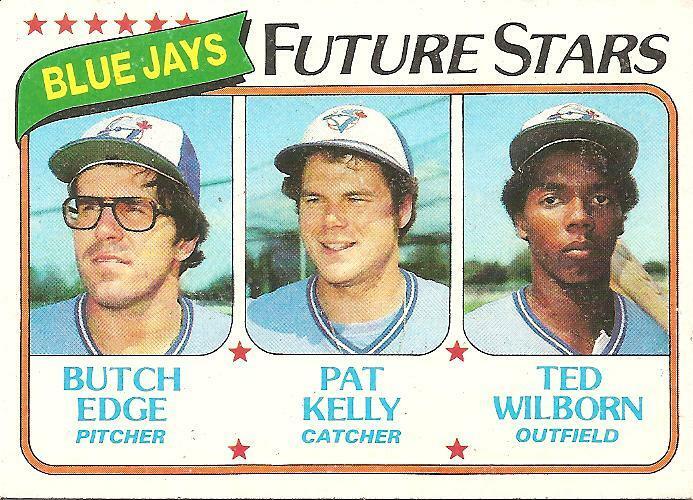 Mixed in among the doubles and the checklists and the nobodies is one of the Future Stars card, for the Blue Jays. The Blue Jays are still brand new and still lose all the time. “Butch Edge,” I say out loud. I have a few small notebooks scattered around, each about the size of a pack of baseball cards. One on a table near some bills, one in a bureau near the bed, one in a drawer with my wallet and keys, one on a file cabinet next to a Future Stars card from 1980 featuring Butch Edge. I used to carry the notebooks around and jot down observations. I planned to channel all the notes at some point into Chekhovian masterworks. For a long time I lived for some vague life to come.I would be a Man of Letters, tirelessly churning the concrete details of everyday life into literature. This future hasn’t arrived. Now there’s the job, chores, a baby. The baby doesn’t sleep. At night my wife and I take turns trying to rock him into letting go of the waking world, but he keeps clinging to it fiercely, the misery of exhaustion amassing on his tiny shoulders but never completely overtaking his insatiable curiosity. Tonight after one of my failed attempts, I gather up all my little notebooks and rip out all the scribbled-on pages so as to salvage the notebooks for making grocery lists. The baby begins to cry. It’s late. I stand there in the kitchen with my hands full of disconnected observations. I feel a little tingly, disintegrating, like a Star Trek redshirt on a malfunctioning transporter pad. Tom gets home from work first and meditates, and then he practices walking across the tightrope he strung across the inside of the garage. On my way out to the backyard, I catch a glimpse of him up there, teetering. I know he’s going to fall off because that’s what always happens, but I look away quick so the last thing I see is him still balanced a few feet above the ground, wavering, his arms straight out. In the backyard, the sheep, Virginia, is munching grass on her side of the electric fence. Near one of the wooden fence posts, there are some of the long-stemmed wheat-looking weeds I like to pluck and chew on like a toothpick. I yank one up out of the ground. If you touch one of these stems to the electric fence you will get a jolt. I take a deep breath, tense myself, and touch the stem to the fence. The fence must be shorted out again. Everything’s half-broken nowadays. I break off a toothpick-sized stem and stick it in my mouth and pretend I’m U.L. Washington, the toothpick-gnawing shortstop for the Royals. All their guys are fast. That’s who they are. Fast and fierce and great. Who are the Blue Jays? Nada, light blue. brand new nada. I stand at the kitchen counter, disintegrating. My baby’s crying. I look down at the little scribbled pages in my hands. What am I holding onto? As I flip them into the trash I catch glimpses. Fragments of dreams. Overheard conversations on the train. One page has some notes that I must have made while talking on the phone to Tom. The notes are about Tom’s tightrope walking. He learned to tightrope walk in 1980 as part of the skills he needed to play the lead role in the town’s production of Barnum, which climaxed with a walk across a tightrope suspended a few feet above the stage. He told me that while preparing for the role, the turning point was when he learned how he could incorporate a fall into the performance. I was going to make a big deal of this provision in my writing somehow, build a whole metaphor around it, but I never did. He’s not with my mom anymore, and when they were together they weren’t married, but I call him my stepfather. He was there every day. I used to have night terrors as a kid. Books that cover the subject often say that these episodes featuring screaming on the part of the child are not remembered by the child, but I always remembered them. One of the ones I remember most was a later one, when they weren’t happening quite as often. Edging into the mid-’80s. The house was empty except for me and Tom. My brother must have been away at school by then, and my mom must have been on some trip. Usually, no one knew what to do with my screaming. No one could help. But Tom held my hand. It helped. I hold out my cupped hand to Virginia across the top of the shorted-out electric fence, pretending I have a handful of grain. It’s a bad trick, but I want Virginia to come over. She does. She doesn’t complain when my palm turns out to be full of nada. She lets me scratch her forehead. She likes it. She can’t purr like a cat or lick you like a dog and her eyes are just dim black nada but she likes it and I love her. My mom will be home soon. Lately the backseat of the Toyota Corolla is full of the bulbs of white flowers. That’s what it looks like for a second, like the car is slowly filling up with flowers, especially if I blur things by taking off my glasses. But put the glasses back on and they’re the tissues my mom cries into all the way home from her job. My mom told me the other day over the phone that I’m a good father. But I don’t know what I’m doing. I guess she sees me being affectionate to the boy. I must have picked that up somewhere, from her, from my father, from my brother, from Tom, how it’s good to be cared for. But in general I feel like most decisions I make are mistakes. Also, my mind wanders. Earlier today, I was watching him at a playground and my mind wandered and the next thing I knew he was holding a bubonically ashen rodent carcass in his hands. I batted it away and carried him to my wife, who scoured his hands and arms with Purell. Even so, she stayed nervous the rest of the day. I was nervous too. How can you have a kid and not be ruined with anxiety every second? On the way out of the park we saw a lividly decaying bird corpse in the grass. “It’s fine, it’s fine,” I said, but my mind was reeling with visions of a mean, imminent future. The future used to be new blue nada, but now? Dead mice, dead birds, poverty, scarcity, epidemic disease. The world on a tightrope, wavering. And tonight, my son can’t fall asleep. Midnight has come and gone, 1 a.m. has come and gone, 2 a.m. has come and gone. This happens all the time. I’ve started falling asleep on my feet, leaving this world for some other for seconds at a time before partially returning, bits and pieces left behind. Waking is now a new way of disintegrating, the present a provisional intersection of fictions. I stop scratching Virginia on the forehead and turn to go back to the house. A man is standing there on the lawn. He looks very tired. There’s the sound, somewhere nearby, of a baby crying. “Butch Edge sent me,” he says to me. This man has glasses. He looks a little like my father, a little like my mother. “Butch Edge has glasses that look like your glasses,” he says. This is true. “Eighth grade?” I say. That’s in the future. “You will get other pairs of glasses,” the man says,his voice back down to a mutter like my muttering dad. Now he’s looking down at the grass like he dropped something. “I’ve never seen you,” I say. He looks back up at me. The baby is still crying somewhere. “What I can tell you about the future is that all your glasses will break, actually, one after the other, or else will just not work after a while because your eyes will keep getting worse. Your glasses will get thicker and thicker.” He looks past me. His eyes widen. “Oh. Virginia,” he says. The way he says it, softly but with his voice going squiggly, wavering, it’s like my mom. That crying baby. I want to do something about it, but I don’t know anything about babies. I try to think about something that I know about. “I have to go sort my cards,” I say. I can hear the Toyota Corolla pulling into the drive. There’s a little mist of sadness over everything. “Butch Edge,” the man says,fading into the nada, the crying. And the crying gets louder and I’m back at the kitchen counter in front of several small narrowed notebooks with blank pages. In 1979, his only major league year, Butch Edge notched three wins. The last was a complete game 3–2 victory over Hall of Famer Jim Palmer and the eventual American League champ Baltimore Orioles. For a moment, the future through thick glasses: not bad. Butch Edge. I go into the bedroom and take the baby from my wife. I can’t get him to sleep but after a while, through nothing I’m doing or not doing, he stops crying. He loves life, hates to sleep. He reaches for my glasses and pulls them from my face and goes blurry. One of his favorite comedy routines: He takes my glasses, I call him a bully, he laughs. In my arms this being of pure laughing light, free of the future and the past, nada light blue brand new nada. I’ll never know what I’m doing. Blind I hold on. Butch found much greater success after he returned to the minors and assumed his doppleganger, alter ego – Tom Henke. Fashion plate that I was, I also had the Butch Edge model glasses but I ditched them for some bitchin’ metal frames in early 1979. Cardboard Gods is a welcome respite, honesty spiked with wild hilarity, as well as the most original writing I read. I buy a pack occasionally to open and read the names to my 1 year old son. Even if he doesn’t understand, it is part, for me, of the spiritual rebirth of a man when he has a son. To go toe to toe with Jim Palmer and battle him all the way to the finish line and a win: what an accomplishment. I hope you keep up the great writing. Thanks, Ochanga. I read baseball cards to my kid, too. I may be imagining it, but he seems to be imitating doing the same when he picks up a card and starts babbling while looking at it. and listening to Bob Starr and Joe Castiglione.